This community has been moved to the Desktop Authority Management Suite community @ Quest.com, where you’ll find knowledge base articles, product videos and blogs, and a forum where you can ask questions and exchange ideas with our product team and peers. Devices: Desktop Authority minimizes the hassles of deploying and securing devices by customizing devices at the first log-in; it configures the firewall and controls browser security for physical, virtual and published Windows environments. Applications: Desktop Authority ensures applications are always available by helping you keep them running, configure shortcuts, customize settings and maintain access to network resources. Identities: Desktop Authority shapes the user environment to the user identity, instantly configuring drives, printers, folders, shortcuts, Outlook profiles and more all tailored to the user's unique needs. Real-time Targeting Engine: Desktop Authority tailors settings and configurations by user, computer, network address or dozens of other criteria using its patented Validation Logic targeting engine. 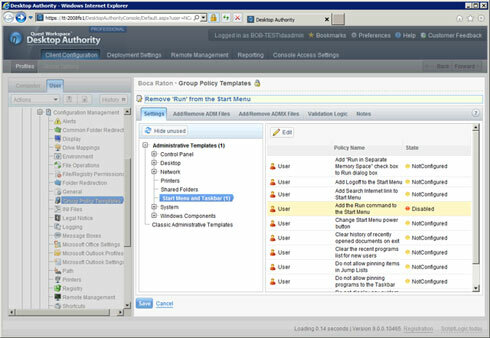 User Environment Configuration: Desktop Authority configures access to company resources, manages security settings, configures Outlook profiles and Office settings, customizes registry settings and more. Windows Environment Management: Desktop Authority takes control of the Windows environment controlling power schemes and inactivity settings. Device Security: Desktop Authority prevents security problems where they're most likely to occur: at the desktop. Set security policies, manage the firewall, lock inactive computers and manage browser security and privacy settings for machines, applications and data. Remote User Support: Desktop Authority's ExpertAssist remote management system allows you to manage more than 40 computer tasks without interrupting the user, including accessing system information, controlling processes, running remote command-line commands, copying files and more. ITNinja is your home for peer-to-peer support, if you require official product support you are encouraged to visit the product's support community.